Found and typed the text of C.L. Farrar about the management of colonies with two queens. Not just an interesting read for those who want to keep two queens in one hive (like the Perone people?) but also for those interested in bee biology, since the honey binding and it's prevention and all sorts of stuff is described. Bernhard, a very interesting read. It does show the possibility of a two queened hive longer than a supercedure event, but I surmise that this is not really one colony but two, in the same space. I am intrigued by the suggestion of multiple queened colonies in big nests, because as you have noted previously one queen may not be able to sustain sufficient egg laying to produce the brood required to escalate the colony up to a super-colony state. Whether this indeed happens, or not (I am still unconvinced as how you would know unless destroying a colony to find out) whether there is a natural mechanism that does this...for example a natural partitioning of large spaces with some shared workers or even two or more distinct colonies. I usually work on the principle that if people can do things there is usually a natural process that people are unwittingly modifying. In his book, Clive De Bruyne talks about having had some colonies from a bee keeper who regularly had 2 queens in colonies, Clive states that the bee keeper in question at one time bred for the trait. After he had had the colonies after said beek gave up because he didn't try and breed for it the trait died out after I think about three years. This was I believe in Nationals. Tried it and I really like it. Last year I tried the Farrar method and it was sort of ok but I wasn't satisfied. So this year I am trying the Peschetz method after Wolfram Peschetz. 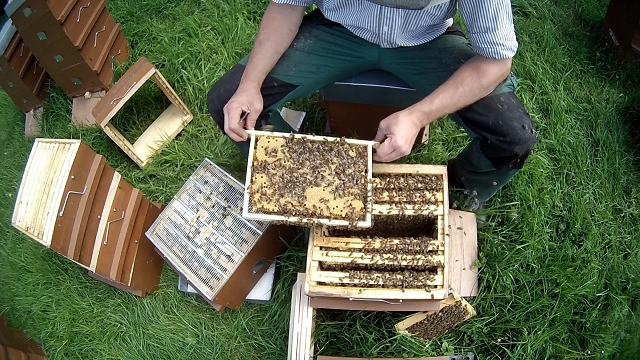 Two brood boxes are vertically seperated into two parts each by a bee-tight division board. Each part gets a queen. 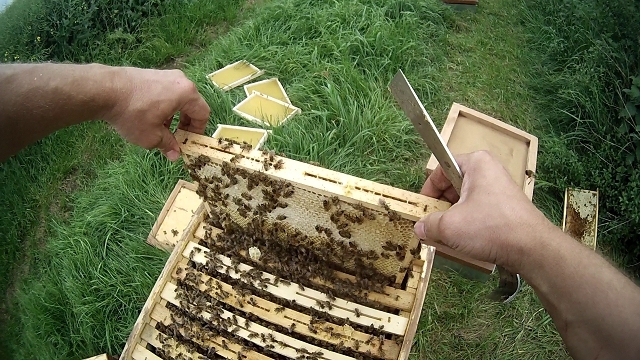 Every month two combs of each section are pulled up into a third box which functions as a buffer zone. The two combs per section are replaced with wax foundations. 1) No queen failure issues. If one queen fails there is the second queen that guarantees the survival of the hive. 2) Both broodnests do warm each other sitting side by side. Same for the winter clusters. 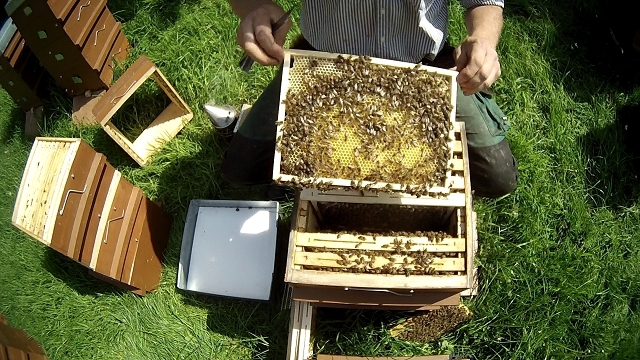 3) A two queen hive can make better use of early Spring flows. It also continues to go strong throughout the season. 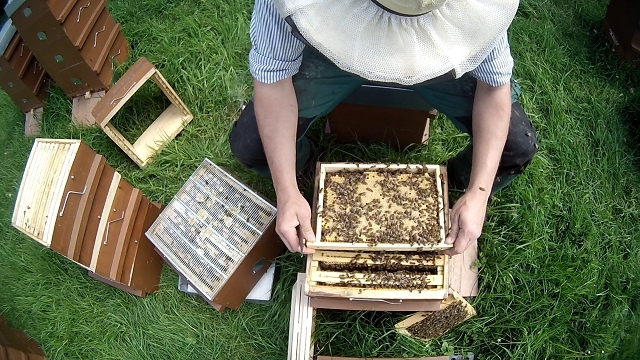 4) Since there are a lot of bees, there are a lot of opportunities to make splits and swarms. 5) By removing all the brood varroa can be reduced. Without the colony decreasing in strength. If you remove all the brood in a one queen hive, this can set back the hive for a long time. 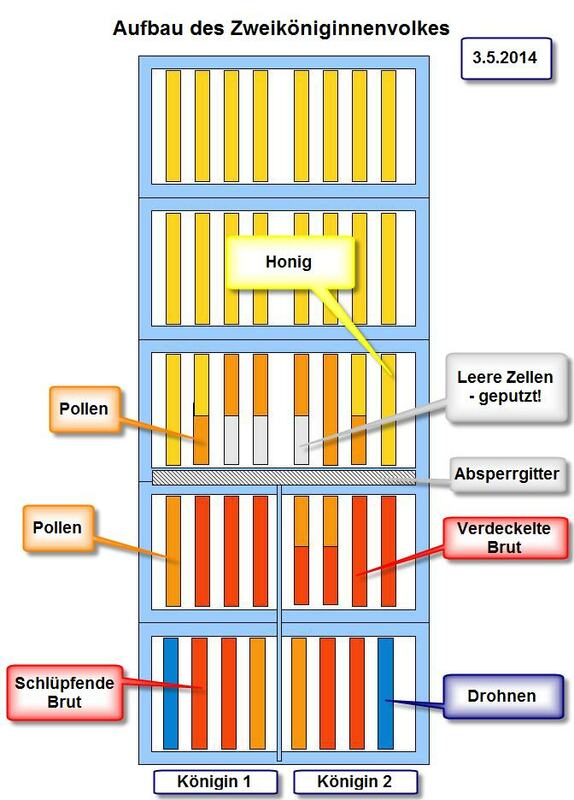 Of course one cannot increase honey production much comparing two one-queen hives with a two queen hive. But the production per box used can be increased dramatically. I tried to document the current situation in the two queen hive. The hive does very well so far. Until today it made a net of 25 kg of honey. This is a good average compared to other hives. My best hives brought more than 30 kg so far. But I started the two queen hive with two small colonies that did not winter well. Other smaller hives just made 3 to 10 kg of honey. If you multiply that by two you get 6-20 kg. Manipulations were minimal. I started that hive which needed about 8 minutes. 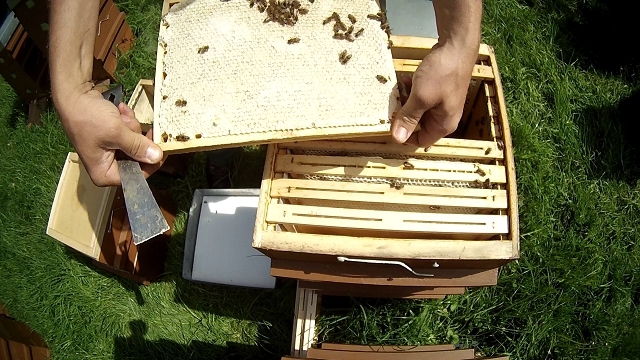 I rised two capped broodcombs (short time before the brood emerges) into the buffer hive box. Replacing them with wax foundations. About 5 minutes. Giving more supers with drawn comb and foundation the same time. Drawn comb in the center, foundations to the sides. That is about it. No checking for swarm cells, nothing. Although other hives had strong swarming tendencies, this could not be found in the two queen hive although it bursts with bees and brood. And pollen. Last weekend I rised another two capped broodcombs. The upmost honey super, well filled with bees. 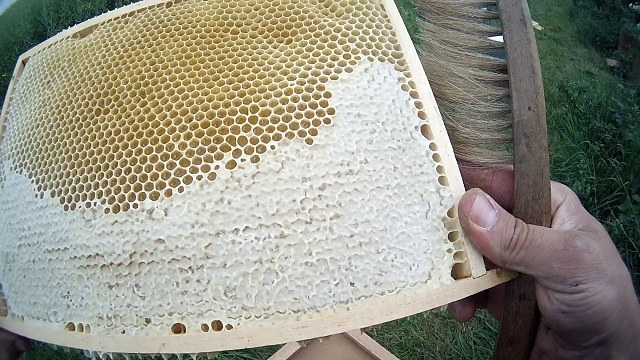 The side combs are filled with honey and pollen. The combs in the center are interesting: those combs have a nice pollen dome and emtpy cells below. 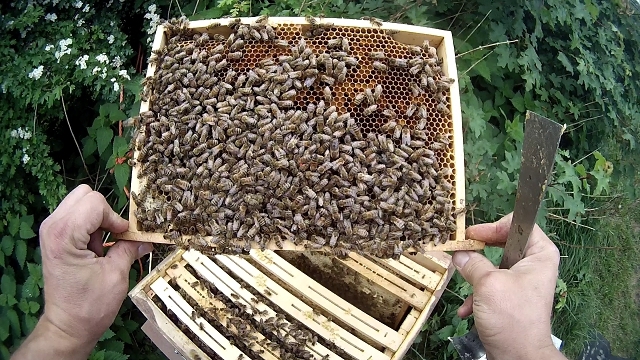 The bees prepare the cells for the queen so she can lay eggs into those cells. The sections have to be covered when working the hive, so the bee queens cannot run into the other part of the broodnest. This is the bottom brood box. Drone comb on the outer side. 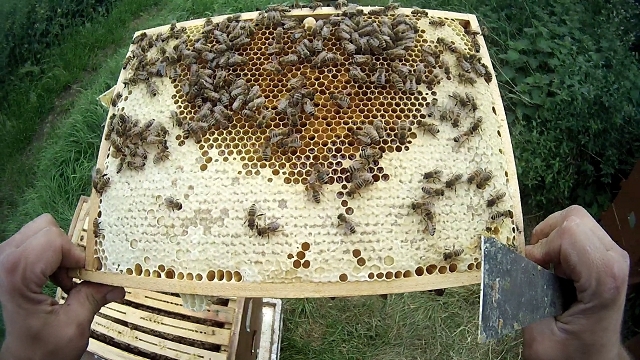 The two combs in the middle to contain emerging brood. The combs next to the division board do contain pollen mostly. 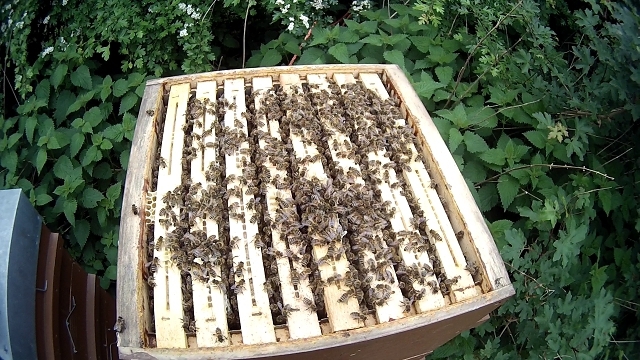 The bottom brood box contains capped brood combs mostly. The upper broodbox has young brood, eggs and larvae. This changes all the time, the lower and upper brood box containing young and capped brood in rotation. Naturally. Without manipulations. I am considering giving a two queen model a go using a long kTBH. There is an entrance at each end and I would populate it with either splits from the same colony OR populate one end with a split from the other end. Hopefully this would keep the scent similar and increase the chances of acceptance. 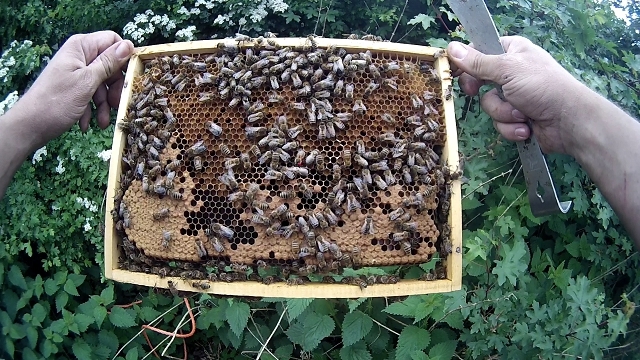 Once the colonies have grown sufficiently along the hive I would then combine them in the middle. The idea being that each queen would stay in the brood nest in each end and not cross the honey barrier in the middle. There would a smaller entrance in the middle to allow workers to return to that area during strong nectar flows.